I don't know about anyone else but for myself, once a new season is here I love adding a couple of new candles to my collection to make my home smell beautiful. I thought I'd share some recent Spring candles I was sent with you all. White Gardenia* | So captivating! The stunning royal beauty of lush white gardenias in full bloom. Lake Sunset* | The serene beauty of the sun's golden rays as they dip into still blue waters, calling to mind the musky descent of nightfall. Fresh Cut Roses* | An intoxicating English garden of fragrant heirloom roses. Pink Sands* | It's an exotic island escape in the beautiful mix of bright citrus, sweet florals, and spicy vanilla. Champaca Blossom* | The rare beauty and joyful spirit of enchanting champaca blossoms come to life in this captivating fruity floral nectar. What's your favourite Spring candle? I love Yankee Candle they're my absolute favourite candle brand! This is a great haul! I love Yankee Candle so much! 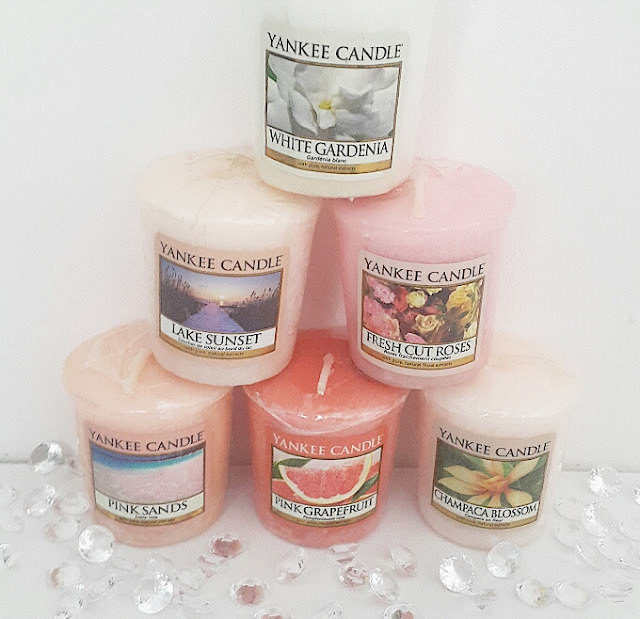 Ooh lucky you to have all these beautiful candles sent out to you! The rose scent sounds absolutely divine, as does pink grapefruit - I've never burned a Yankee candle so I really need to try them out! I have a serious candle addiction and have to physically restrain myself from buying any more. I got the Pink Grapefruit one for my birthday last year and I love it. Such a beautiful fragrance. I think if I had to choose out of those, Pink Grapefruit would be my choice, it sounds so nice! I need to have all these candles! I am currently burning a cherry candle which smells amazing! Pink Sands is one of my favourites! Love the smell!